Come join us for Family Movie Night! 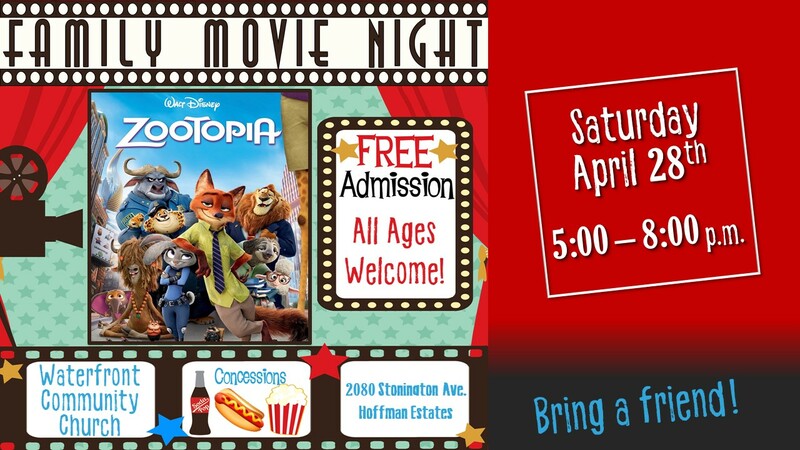 We will be presenting the family friendly movie Zootopia (Rated PG). Our evening will start at 5 pm with fun family activities before the show. This will include a chance for Arts & Crafts, face painting, and games! You can also use this time to enjoy some snacks from our FREE concessions stand. We will have popcorn, hot dogs, candy, and drinks. The movie will begin at 5:45, and the concessions will be open during the movie so feel free to return for refills. Kids can bring their pillows and blankets to “cozy up” in the Kid-viewing area to watch the movie! We are looking forward to you joining us for our zoo-themed, fun-filled evening!